Last year in October, the Centre for Strategic and International Studies (CSIS) in its report titled US-India Security Cooperation recommended that the new US President should meet the Indian Prime Minister (PM) within the first 100 days. Prime Minister Modi will be interacting with President Donald Trump on June 26. This is approximately 157 days after President Trump assumed office. Given the tectonic shifts in US politics, probably it is to the benefit of the bilateral relationship that the two leaders have taken a few additional days than recommended to interact with each other. In spite of visits by senior officials to each other’s capitals and considerable preparatory work, the India media is terming this as a low-key and no-frills visit by the Prime Minister. Probably, such characterisation captures some apprehension in Delhi as to how the dialogue between the two leaders may pan out. This concern is based on the perception that there are three serious limitations to the foreign policy grand strategy that the US President has adopted. First, President Trump has demonstrated a penchant for immediate transactional outcomes without pronounced reference to the global and regional balance-ofpower. In an interview with Oprah Winfrey way back in 1988, Trump stated that “making our allies pay their fair share” should be one of the core principles of US foreign policy. Now, Trump seems to be operationalising this principle as the President of the United States. For instance, he suggested that Seoul should pay for the deployment of Terminal High Altitude Area Defense (THAAD) missile systems, much to the discomfiture of the South Korean leadership. More recently, he publicly reprimanded some of the North Atlantic Treaty Organization (NATO) allies for failing to contribute “their fair share and their financial obligations.” These statements by President Trump give an impression that the US engagement is less defined by the rapidly changing balance-of-power, and are more concerned about shortterm gains. This has implications for India as well. Till recently, many US policymakers had often stated that the rise of a democratic India is in the long-term interests of the US. However, one wonders if the current US leadership, beyond perfunctory remarks about India’s rise, has an appetite for such long-term strategies. Second, the withdrawal from the Trans-Pacific Partnership (TPP) and the Paris climate agreement demonstrates the current US leadership’s lack of enthusiasm for multilateral frameworks. On the other hand, with the increasing pace of power-shift to the Indo-Pacific region, India is seeking to work with the US in developing robust multilateral frameworks. This implies scaling up of initiatives, such as India-US-Japan Trilateral relationship and strengthening of security architecture through the East Asia Summit forum. One needs to wait and see if Trump’s administration would be keen to work on such scaling-up. Third, Trump tends to openly deploy territorial issues in the overall negotiation strategy. For instance, he stated, “I fully understand the 'one China' policy, but I don't know why we have to be bound by a 'one China' policy unless we make a deal with China having to do with other things, including trade.” Subsequently, President Trump and other US officials quickly restored the status quo ante. With India, thus far, Trump has not deployed similar strategy. According to a read-out released by the Pakistan government, in telephonic conversation with Prime Minister Nawaz Sharif, President Trump reportedly stated that he would be willing to play any role in resolving all long-standing disputes. This statement was interpreted as a reference to the Kashmir dispute. However, US government officials reportedly expressed displeasure at the release of the read-out and refrained from confirming its contents. Subsequently, the US Ambassador to the United Nations, Nikki Haley’s statement on India and Pakistan was interpreted by some as US willingness to mediate between the two countries. 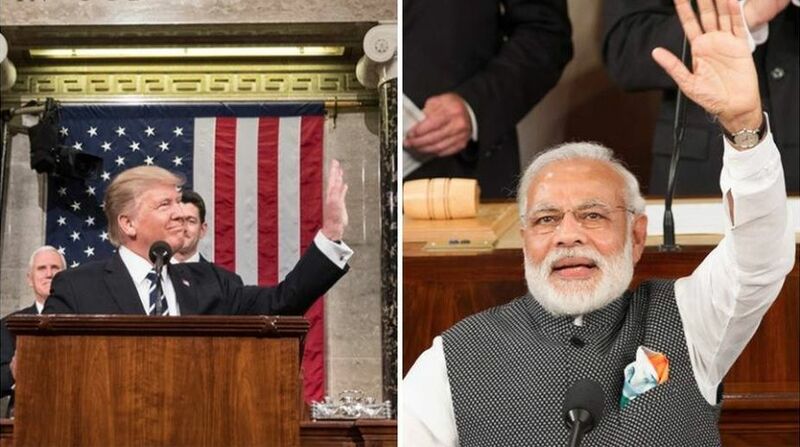 If the current US leadership seeks to link territorial issues of India with market access issues, it will not find any traction with the Indian leadership. In 2016, India’s goods and services trade with the US stood at approximately $114.8 billion with a trade surplus of approximately $30 billion. It is now well-known that Trump views US trade deficit as a consequence of unfair trade practices by some countries. Therefore, the Indian leadership may face repeated demands for greater access to the Indian market for American companies. Trump has already vowed to contract the H1B visa programme and act aggressively against the outsourcing industry, which will negatively impact the growth of Indian software companies. These three grievances – trade deficit, alleged misuse of H1B and the growth of outsourcing industry – will now be added to the already existing list of grievances pertaining to Intellectual Property Rights and local content provisions in government procurement. As one can see, navigating this economic relationship will require deftness, nuance and patience. It is likely that in the Trump administration, economic/trade relationship may determine the other pillars of bilateral relationship with greater intensity. Inspite of these limitations, the India-US defense partnership may witness sustained growth and may give impetus to the overall relationship. The defence relationship between the two countries has witnessed a remarkable upswing in the recent past. A decade ago, US defence sales to India were almost non-existent. Today, US companies have bagged approximately $ 15 billion worth of defense deals. The recent agreement between Tatas and Lockheed Martin to manufacture F-16s in India suggests a possible way of reinforcing the robust security as well as business relationships. Probably, the Tata-Lockheed agreement should be taken as a model where companies of the two countries can enter into business agreements away from the political arc-lights. Such agreements will also have substantive impact on regional geopolitics. These challenges do not indicate deterioration in the bilateral relationship. But they point to creeping anxiety about the necessity to meet the growing expectations of the India-US strategic relationship. India and the US can do a lot for each other as well as for others in the wider Indo-Pacific region. Hopefully, the Modi-Trump summit will provide us with outcomes that dispel the cloud of uncertainty which has cast a shadow on an important strategic partnership in Asia. The writer works as a Senior Consultant at ICRIER, New Delhi. The views expressed are personal.